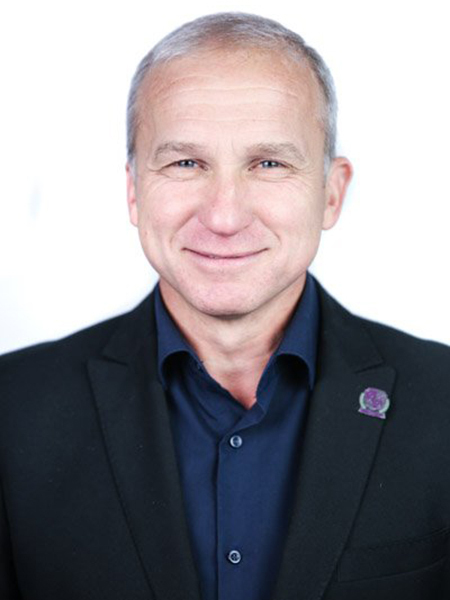 KIZYMA Andriy – Dean of the Faculty of Finance in Ternopil National Economic University, Candidate of Economic Sciences, Associate Professor at Department of Taxes and Fiscal Policy. Andriy Kizyma was born on August 1, 1966. He graduated from secondary school No. 1 in Ternopil city. In 1983 he entered Ternopil Financial and Economic Institute, Faculty of Finance, in 1989 he graduated with honors in the specialty "Audit and Control" and received the qualification of an Economist. From 1985 to 1987 he was doing military service. Before his post-graduate education he worked as an Economist in the Scientific and Research Sector of Ternopil Financial and Economic Institute. In 1989, he was enrolled for the off-job post-graduate studies in the specialty "Audit and Control" in Ternopil Financial and Economic Institute, which he finished in 1992 and defended his Candidate’s thesis in Kyiv National Economic University in December of the same year. From 1992 to 2000 he worked as a lecturer, senior lecturer, and Assistant Professor. Since 2000 he has been working as an Assistant Professor of the Department of Tax and Fiscal Policy in Ternopil National Economic University. Kizyma A. is the co-author of the textbook "Tax Management" (2008) with a note "Recommended by the Ministry of Education and Science of Ukraine", the training manual "Tax Management" (2004) with a note "Recommended by the Ministry of Education and Science of Ukraine", the training manual "Planning and forecasting of tax revenues” (2005), the educational-methodical manual "Tax management" (2002); the training manual "Planning and forecasting of tax revenues" (2011) with a note "Recommended by the Ministry of Education and Science of Ukraine", the textbook "Tax Management" (2014). The total number of scientific, educational & methodical works - 102. He teaches a training course: tax management. Scientific interests: tax management in Ukraine: methodology and practice. Faculty of finance: solid past, confident present, successful future! Faculty of finance is an integral part and the largest component of ternopil national economic university that provides teaching and educational process. Today, 1024 students not only from the most diverse corners of ukraine, but also from abroad receive education at our faculty. This is expected, as all the specialties of the faculty are focused on the training of qualified specialists in such spheres as: organization and functioning of the financial system, insurance, fiscal administration and customs business, management of household finances, etc. - department of finances of economic and insurance entities, where 11 doctors of sciences, professors, 60 candidates of sciences and associate professors work. All necessary conditions for combining the teaching and scientific activity at the faculty are created. Scientific work is considered an integral part of the educational process. There are active student scientific clubs: "financial space" (coordinated by the s.i. Yurii department of finance), "tax analytics" "customs expert", "english speaking club" (coordinated by the department of taxes and fiscal policy), as well as the club "corporate finance and insurance", whose work is coordinated by the department of finances of economic and insurance entities. Under the guidance of this department, students of the faculty have created "the first student insurance company", which is a joint project with jsc "insurance company "skaid". Financial experts, who have achieved high results in scientific work, receive recommendations for admission to the post-graduate studies, they work as lecturers-trainees and researchers–trainees at the graduating departments. In addition, graduates of the faculty successfully work in prestigious positions at the state management bodies (in the system of the ministry of finance of ukraine, the ministry of economic development and trade of ukraine, the state fiscal service of ukraine, the state travel service of ukraine, the national bank of ukraine, in state institutions regulating the functioning of the financial market), as well as in leading positions at non-state financial institutions (including: in national and international companies; financial institutions and enterprises, insurance and audit companies, customs brokerage offices, etc.). An important condition for the high-quality functioning of the faculty is student self-government, which exists to create favorable conditions for students to fulfill their duties and provide the protection of their rights. It supports the harmonious development of the personality of the student, forms the skills of the future organizer/leader in them. Activities of the student self-government at the faculty are focused on quality education, development of spirituality and culture of students, growth of social activity and responsibility in young students. Student workdays of the financiers consist of not only excellent studying and scientific activities, but interesting leisure time-activities and unforgettable holidays. Therefore, students of the faculty always actively participate in different festivals, contests, and quests, which are held both at the university and outside of it.